Users can provide a list of IP addresses that are on the array to include as NFS storage. Users can provide a list of IP addresses to exclude from NFS storage ports even if the addresses are found on the array. This is done by preceding the list with a hyphen (-). In the previous versions, when a test failover was performed on an iSCSI LUN that was virtually provisioned, the test failed and an error in the log file was generated for the file system not having enough free capacity. In version 4.0.22, the test failover completes successfully and a warning message is generated if the destination file system does not have enough free capacity to fully inflate the LUN if it grows. Test failover relies on a snapshot of the destination LUN/FS that is created. The snapshot creation task is blocked until an active replication transfer is completed. In the previous versions, when a test failover was performed, the replication transfer in progress for a LUN/FS failed immediately. After the transfer was complete, a snapshot was created. If the replication transfer did not complete within the timeout established by SRM, the test failover failed, but the snapshot request was queued on the destination Celerra. The snapshot was created when the transfer was completed. This resulted in test failures and orphaned snapshots. Version 4.0.22 determines if an active transfer can complete within the SRM timeout before it creates the snapshot for test failover. If the transfer is not complete, the test failover fails immediately and an error message is logged with a suggested time to retry the test failover. If the transfer can be completed within the SRM timeout, the SRA monitors the replication transfer until it approaches completion and then issues the snapshot command. Provides the ability to input login information (hostname/IP, username, and password) for two vCenters and two Celerras. Cross references replication sessions with vCenter datastores and virtual machines (VMs). Provides the ability to select one or more failed over Celerra replication sessions for failback. Supports both iSCSI and NFS datastores. Manipulates the vCenter at the primary site to rescan storage, unregister orphaned VMs, rename data stores, register failed back VMs, reconfigure VMs, customize VMs, remove orphaned .vswp files for VMs, and power on failed back VMs. 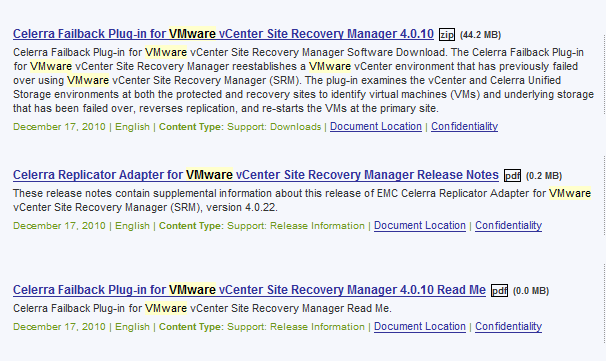 Manipulates the vCenter at the secondary site to power off the orphaned VM, unregister the VM, and rescan storage. Identifies failed over sessions created by EMC Replication Manager and direct the user as to how these sessions can be failed back.